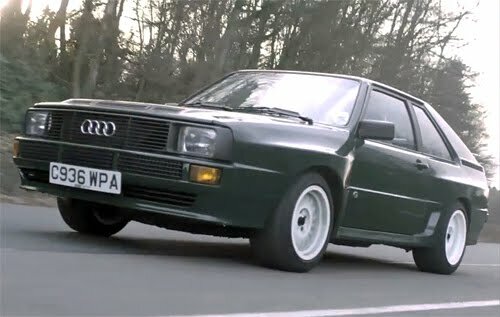 Video: Drive's Chris Harris compares Audi Sport quattro and Ford RS200 in "Group B Worship"
In his latest episode of Chris Harris on Cars on YouTube's Drive channel, Chris Harris explores, hands on, two street cars born from the Group B golden era of rally racing: the Ford RS200 and the legendary Audi Sport quattro. With a production run of roughly 200 units and an original price tag of 200K+ German Marks, the opportunity to drive an original Sport quattro doesn't come around very often—even if your Chris Harris. As Harris notes in the video's description, "...the chance to drive an RS200 and a Sport Quattro nearly sent me to the nut-house. Fire up the Quattro!" Video after the jump. FYI: For those of you not interested in the RS200, the Sport quattro bit starts at the 8:00 minute mark.